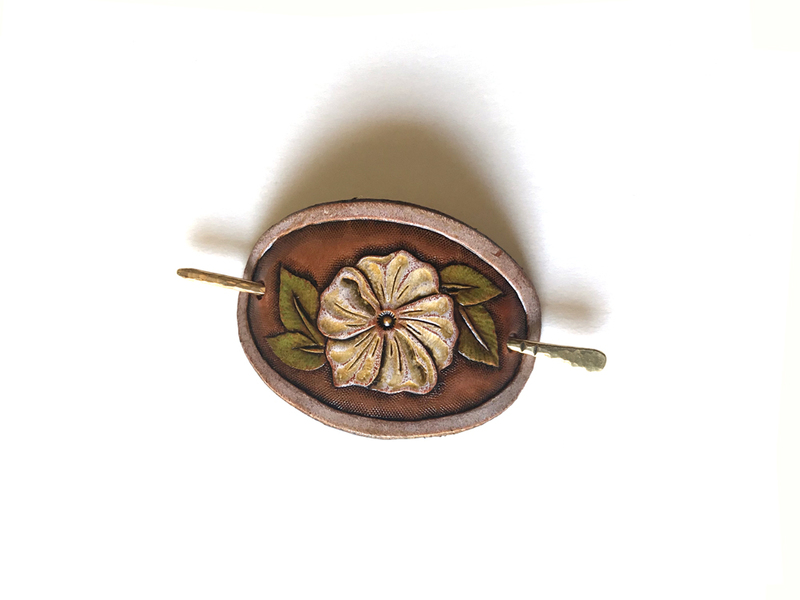 Hand carved and hand painted wild rose design on leather paired with a hand hammered brass hair stick with stamped accents. Traditional metalsmithing and leather crafting hand skills are utilized in every individual piece. The leather goes through many steps from carving and stamping to the finishes to become what you see. Because they are made by hand one at a time (no machine stamping here!) and because of the variances in the leather, no two pieces are alike. They may vary slightly in design, painted colors and tone of the leather itself. The brass hair sticks are also hand hammered and stamped. No more broken wooden sticks! A truly handcrafted piece of wearable art. The leather measures 2.75″ wide and 1.75″ tall. The brass hair stick is 3.25″ long. This small size is best for short and/or thin hair, or for tying back a portion of your hair for longer/thicker hair. If you need to make the clip more secure, try tying your hair back with an elastic first and placing the hair clip over the elastic with the pin going through or just above the elastic.